Vsevolod Meyerhold was a the creator of a new acting system called “Biomechanics”, Russian and Soviet actor and theater director. It is hard to overestimate his role in the development of the Russian theater. He left law school and enrolled in the scatting classes taught by Vladimir Nemirovich-Danchenko at the Moscow Philharmonia, and later he was invited to join the trope of the newly founded Moscow Art Theater. In the first MAT season, he played Treplev in The Seagull. After a falling out with Stanislavsky, Meyerhold left the Moscow Art Theater and founded his own troupe in the Russian provinces. In 1906, the actress Vera Kommissarzhevskaia founded a theater in St. Petersburg and invited Meyerhold to direct. There he staged Alexander Blok’s The Puppet Show among other major productions. Later he was invited to direct at the Imperial Theater in St. Petersburg. He remained there for the next decade, staging both plays and operas. Meyerhold attracted international attention at the two St. Petersburg imperial theaters with his dazzling productions influenced by the conventions of commedia dell’arte and other nonrealistic theaters. 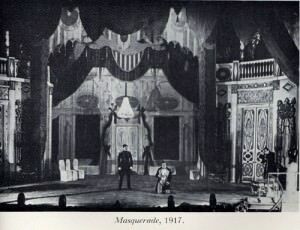 The most opulent spectacle ever seen on the Russian stage was his production of Mikhail Lermontov’s Masquerade, which first shots were fired in the Russian Revolution (February 1917). When the revolution occurred Meyerhold quickly joined the Communist Party, he was appointed head of the theater division of the People’s Commissariat for Education. In this period Meyerhold staged many notable productions including the first production of Mayakovsky’s Mystery-Bouffe (1918). 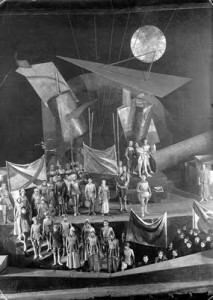 Meyerhold staged a number of famous constuctivist productions, including Fernand Crommelynk’s The Magnificent Cuckold and Alexander Sukhovo-Kobylin’s The Death of Tarelkin. He had his own troupe in Moscow, and staged innovative productions of both classics and new works. The best known were Nikolai Erdman’s The Mandate (1925), Nikolai Gogol’s Dead Souls (1926), and Vladimir Mayakovsky’s The Bedbug (1929). Meyerhold’s relentless experimentation was no longer in favor because his theater was harshly criticized . In the early 1930s, when Joseph Stalin repressed all avant-garde art and experimentation, his works were proclaimed antagonistic and alien to the Soviet people. His theatre was closed down in 1938; Then Stanislavsky and Nemirovich-Danchenko, invited Meyerhold to lead his company, but Stanislavski died in 1938, and Meyerhold was arrested in 1939 after his last triumph on June 13-15, in 1939, at the All-USSR Director Conference. After a day of torture, Meyerhold signed all that executioners wanted him to, confessing to spying for the British, the Japanese, and stated he was an opponent of the Soviet regime and Soviet art. On February 2, 1940, Meyerhold was executed. He was buried in Donskoye cemetery in Moscow, in a mass grave. Meyerhold inspired revolutionary artist and filmmaker, Sergei EisensteinIn and his films, he used actors who worked in Meyerhold’s tradition and stylized acting methods. In Strike, the bourgeois are always obese, drinking, eating, and smoking, whereas the workers are more athletic. Meyerhold had been Stanislavsky’s apprentice until 1902. 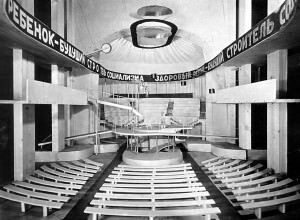 That year, after playing twenty parts on Moscow Art Theater’s stage, he announced his rejection of Stanislavsky’s methods, left the troupe and turned from acting to directing. Together with Aleksandr Kosheverov, he organized The New Drama Fellowship in the city of Herson, Ukraine. His first performances resembled those of MAT, but soon he started experimenting, looking for a new theater style and a new expressive means. Nemirovich-Danchenko called Meyerhold’s ideas “the muddle, created by a man who discovers several new truths, pushing another one every day”, or also “nonsense”, “hell knows what” and “scrambled eggs with onion”. As opposed to Stanislavsky, Meyerhold was indifferent to the psychological side of acting, but he was fascinated by its visual side. He made the actors work on body movements, not on character study, and assured them that “buffoonery and clowning are necessary for an actor, and the simplest simplicity should include the elements of the clown”. His performances resembled marionette theater shows. Meyerhold regarded movement, gesture, space, rhythm and “music” as the primary elements of the “language of the theatre.” He dreamed of “retheatricalizing” the theatre, of creating a theatre that would give its audience truthful images of life but that wouldn’t imitate or copy life. 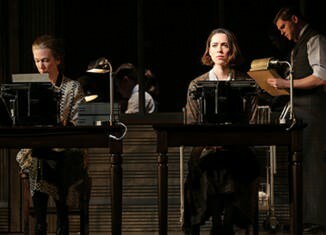 A ccording to Meyerhold, a director should, begin his work in rehearsal with the search for form, which begins with the creation of a “movement score” for the production. The director’s task is to create “a pattern of movement on the stage” by means of a “deft mastery of line, grouping and costume color”. Movement on the stage is created not only by “movement in the literal sense, but by the disposition of lines and colors and by the ease and cunning with which these lines and colors are made to cross and vibrate”. The actors were simply not equipped to meet the demands made of them. Meyerhold realized that an exploration of actor training was going to have to run in tandem with his exploration of form in the theatre. He would have to create a system for training artists that would enable them to give life to the forms he envisioned. For the next thirty-five years, Meyerhold explored a vast array of styles as a director and developed the system of actor training and approach to theatre that would become known as “Biomechanics.” Probably the most striking thing about training in Biomechanics is the degree of integration between “purely” physical training and the application of that physical work to concerns specific to acting. The training is highly systematic and sequential. aActors are asked to do a great variety of exercises: work with objects such as balls and dowel rods, leaps and rolls over platforms and up and down ramps and stairs, and partner lifts and acrobatics. This phase of the work culminates in the study of the Classical Biomechanical Etudes. 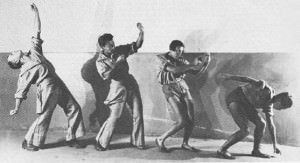 These are highly stylized movement pieces which Meyer hold choreographed as exercise material for his students. All of this develops the actor’s sense of her/ his psycho-physical being as a malleable instrument and an awareness of space and rhythm as variables to be explored in the creation of a role. The actor’s heightened awareness’s and capacities are equally valuable for work that is highly theatrical or absolutely realistic. As Igor Ilynsky, one of Meyerhold’s finest actors put it: “Technique arms the imagination”. He had actors focus on learning gestures and movements as a way of expressing emotion physically. Following Stanislavski’s lead, he said that the emotional state of an actor was inextricably linked to his physical state, and that one could call up emotions in performance by practicing and assuming poses, gestures, and movements. He developed a number of body expressions that his actors would use to portray specific emotions and characters.